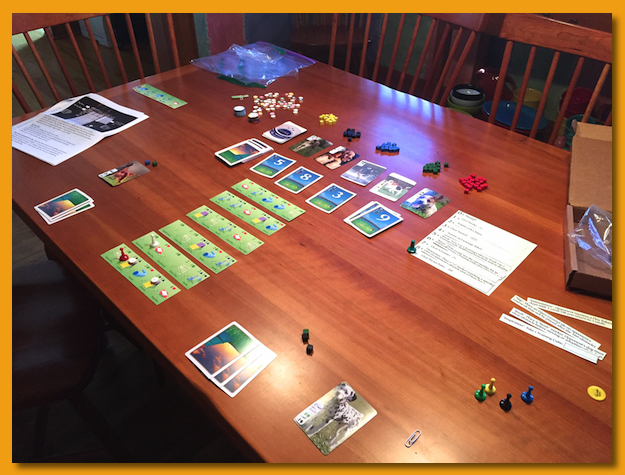 Agility is a new game from Brent Povis and Two Lanterns Games. Brent and I became friends at Origins back in 2012 when he was showcasing his first game, Morels, in a small booth near the back of the convention hall. He and I have kept in touch via email over the years and I was honored when he reached out to me to take a look at his new game before the Kickstarter launch. I have to give him a lot of credit on the unique theme and how apropos that it falls on the meatier end of the spectrum for his games too! My wife and I were fortunate enough to visit New Zealand a few years ago and on hikes, it was common to cross farmer’s fields to get to scenic areas. On one particular hike, we heard some high-pitched, sharp, whistles from a distance and we stopped to watch a farmer train his dogs how to herd a small group of sheep in various ways up and around a beautiful green, sun-dappled hillside. I still have fond memories of watching how the dogs worked as an extension of the farmer communicating on levels I cannot comprehend. Being able to play a game that captures the flavor of that strong bond between humans and dogs in an effort to meet some common goal is a real treat. Some important points to take note of before we get into the review. Brent sent a paste-up copy for me to play and we discussed the use of images in my review. Although some of the artwork is nearing completion and he approved my use of images, I want to make it completely clear that the images in this review in no way represent the final version of the game. Vince Dorse was heavily involved in the awesome artwork of the original version of Morels and since he’s signed up for Agility, I’m sure we can expect some great things! 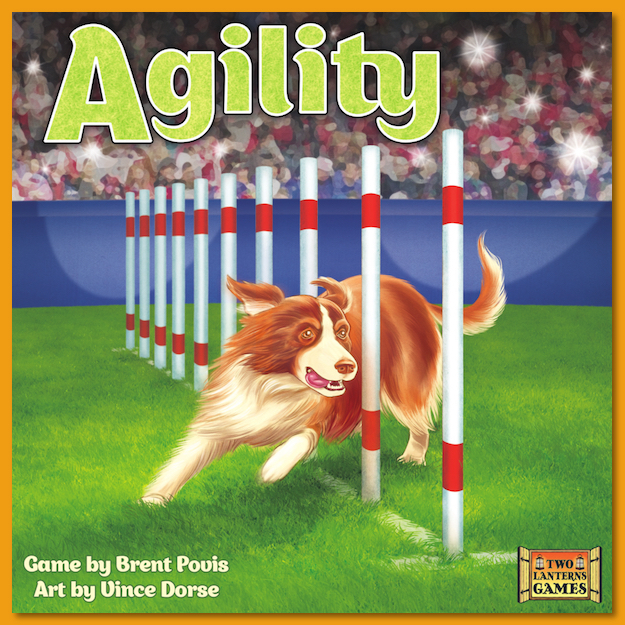 In Agility, two players face-off in adopting and training three dogs, choosing an agility course that best suits their natural abilities, and then working with them to be the first player to get all three up, over, around, and through the obstacles on those courses. Players take turns playing a card from their hand. The card depicts two (of five) types of training cubes in varying amounts. The player can choose one of the two types earning the appropriate number and type of training cubes. The large number on the card represents the number of steps a marker will move (for playing the card) on an action track. The action track acts as a rondel of sorts. As the marker is advanced it cycles around the actions and wherever it stops, the player immediately takes the indicated action, if possible. These actions and their order on the rondel are different each game. Some actions grant the player more cubes, some allow adopted dogs to freely traverse a specific obstacle they’re currently faced with. Other actions earn specialized tokens to be used on subsequent turns (more on that later), and yet others introduce some direct conflict with the other player by allowing one player to introduce more difficult (and even more) obstacles in their opponent’s courses. 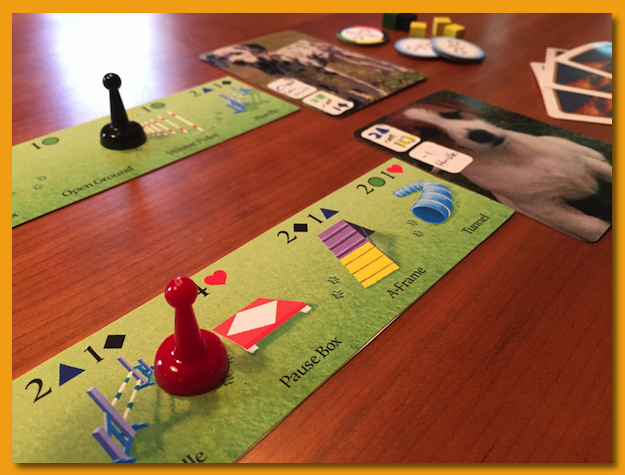 After taking the action indicated on the rondel, the player can optionally adopt one of the three dogs they’ll adopt in the game. Players choose one from the set of five face-up dogs and after choosing one, a new dog is drawn from a deck of available dogs. Each dog has a training cost paid with previously acquired training cubes. In addition, each dog has a natural ability (e.g. Clear A-Frames) that can help them traverse a chosen course more easily. After paying the training cost of adopting the dog, the player selects one of the available agility courses and places the dog’s marker at the beginning of the course. 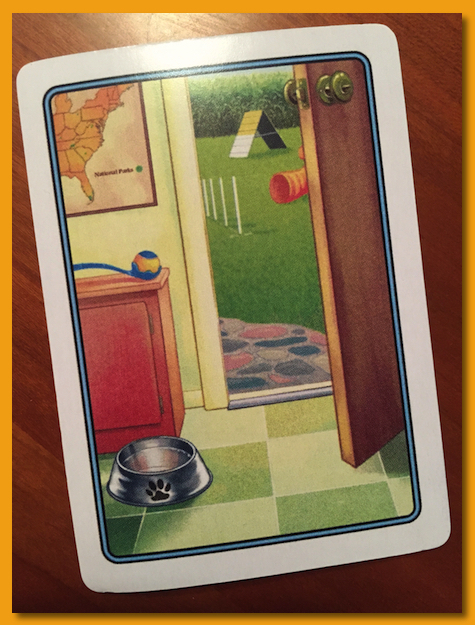 When we played, we moved the chosen agility course from the available courses, placed it in front of us, moved the dog card next to it, and placed the dog at the left end of the course, next to the card. There are a handful of different courses available in the game and it’s my understanding that they’ll be printed on double-sided, thick tile stock. Six courses are randomly chosen for the game so each game will be slightly different. 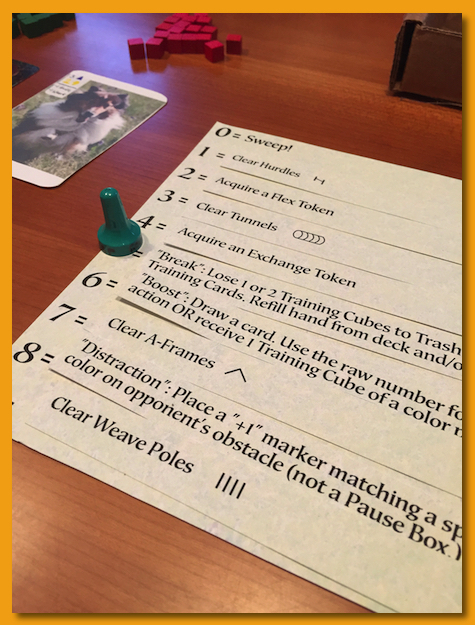 After optionally adopting a dog, the player has the opportunity to pay training cubes to advance a dog on each course. There are specific rules about this traversal that limit and/or allow dogs to move quickly through multiple obstacles depending on their natural abilities etc. During the game players have the opportunity to earn single-use Exchange tokens that allow players some flexibility in cashing in all training cubes of one type and replacing them with equal numbers of cubes of a different type. In addition, players can earn single-use Flex tokens which allow for the ability to take an action one rondel space above or below the space where the marker landed. Timing the use of these tokens correctly can be key. Of the six obstacle types (weave poles, hurdles, A-frames, tunnels, open ground, pause box), the pause box is special. After traversing the pause box by paying red training cubes, players get the chance to play a mini-turn. The pause box can be tough to overcome but timing that mini-turn can also be crucial. I give the game high marks for the tension that it creates. Players are forced to juggle several variables on a turn to do well. Weighing the effects of playing one card over another gives the game that delicious sense of anticipation of what comes next. 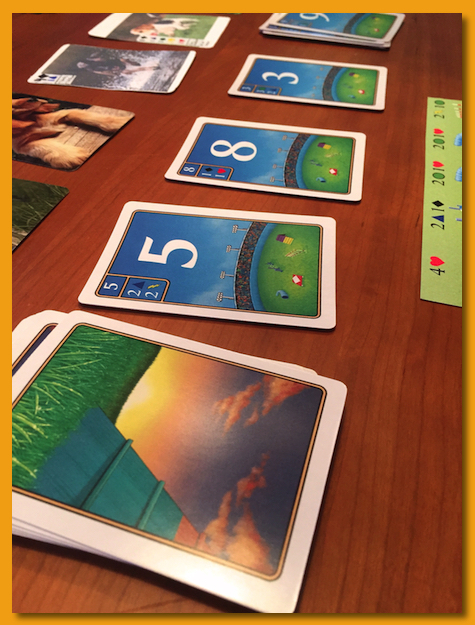 A single card play earns cubes but also drives which action you’ll be taking on the rondel. Sometimes those two are at odds with each other. 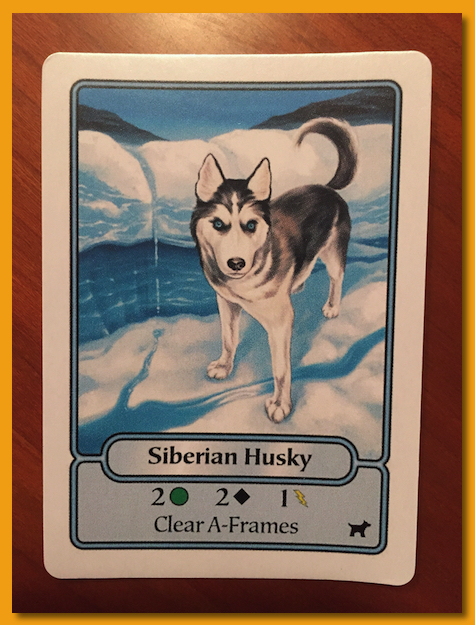 Do you spend cubes you have now to adopt a specific dog before your opponent or do you use some of them to advance dogs already on their course? Should you claim an agility course now or can you afford to wait a turn or two? Do you play a card solely for the action it gives you even though you really want the cubes granted from a playing a different card? Brent has done a great job and earns high marks at taking a unique theme and wrapping it around a tension filled experience in this stream-lined two-player game. Amazingly, like Morels, he’s managed to accomplish what even seasoned designers struggle with: boiling down the game, reducing complexity, and leaving only just enough rules to make it great. I’m really looking forward to the Kickstarter and I wish him all the best. It takes a lot of time and effort to keep Marquand.net current. Donations are much appreciated. Mini Painting: Who Goes There?